It's been a long time, y'all. I've been out sick the last couple weeks. I fought it for a week but I couldn't escape. None of us could. And so I've been offline for a bit. So. Curtains. Let's talk about hanging curtains. And how almost every store and catalog gets it wrong. It's one of my pet peeves because it means that I can never find what I want in the store. They have too short curtains hung just level with the window frame. If you want your curtains to look like they were hung by a real designer, here are the three tips to remember! 1. Hang your curtains high. Higher curtains create an illusion of height and make a bigger impact in a room. Imagine a grand old room with large windows and dramatic loooong drapes covering them. Like something from Pride and Prejudice. You can get that big impact with modern curtains just by hanging them higher. Unless you have a super high ceiling or a funky angle near the windows, curtains to the ceiling are amazing. My house has standard 8' ceilings so I hang my curtains as high as they will go, almost to the ceiling and at least a foot above the window frame. This is why I can't buy curtains in a normal store because I need extra length to reach the floor. If you have a super high ceiling, hang curtains about 6-12" above the window frame. Too much space between the rod and the window might look a tad awkward. 2. Get the right length. Standard curtains are 84". Since I raise my curtains higher, I need 95" curtains. Because of the extra length, my curtains puddle a bit on the floor. I happen to like puddling curtains which is great for me because I'm kinda lazy and don't want to take the time to shorten them. 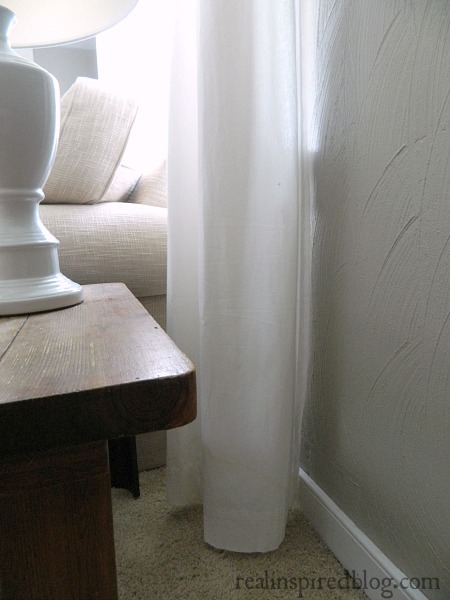 If puddled curtains aren't your look, buy longer and have them hemmed, or get some iron-on fabric tape to hem them yourself. Too short curtains are like a man walking around in too short trousers with a suit coat. 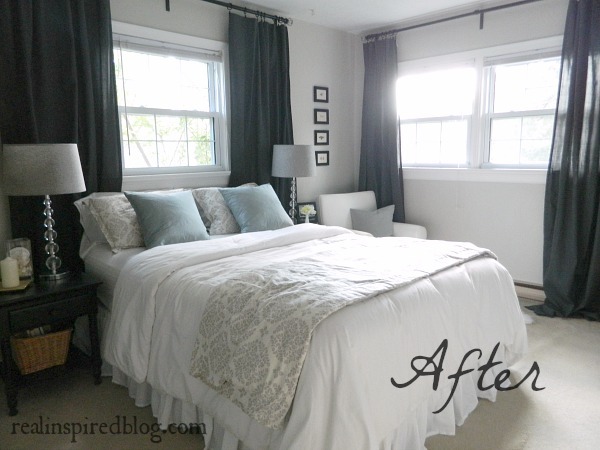 Your curtains should always be right at floor length or longer. The only time shorter curtains are even allowed are for windows over sinks and built-ins, like in our nursery. You can even pull off long curtains over heaters if you layer them over blinds for privacy, hang them wide, and/or pull them back out of the way. If your windows are shorter(like ours upstairs), stay away from the short curtains! It will only accentuate the shortness of the window. You want to create the illusion that your windows are bigger than they are. Hang them high and make sure that they at least skim the floor at the bottom. 3. Hang curtains wider than the window frame. This adds to the impact and the illusion that your windows are bigger than they are. Plus, it lets in maximum light! If your curtains are open, no part of them should be over the window. My rule is at least six inches out from the outside of the window frame. If you have a window that is butted up against a wall, hang the rod as close as you can to the wall and extent it out at least 6 inches on the other side. In our master bedroom, we have a big double window and a small single window. It felt off balance. To "fix" it, I hung the curtains over the small window exactly like the ones over the big window. 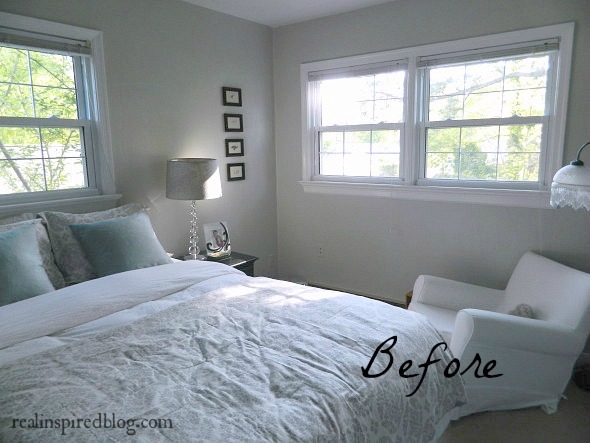 It created a backdrop for our bed while also making the small window look bigger and balancing out the room. Also notice the long curtains with the short windows. Imagine if I'd used short ones that stopped right under the window sill! Next time you're tempted to buy those 84" curtains, just say no! Many times you can buy the same curtain online in the longer length. Do what the designers do. 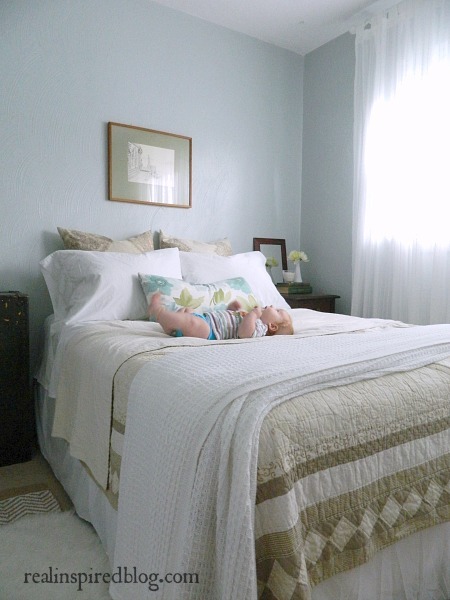 Hang those babies high and wide and see how much of a difference it makes in your room!